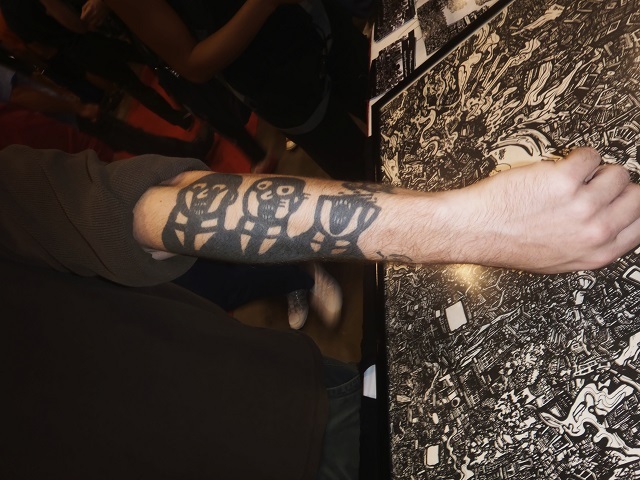 Comic Drawings on Random Objects! 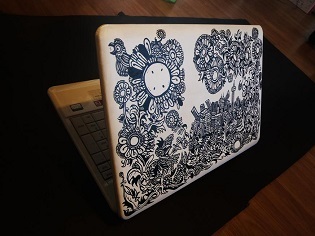 Ever since I started making these crazy black and white drawings my work has shown up on a variety of odd “canvases”. I personally love to work on paper, canvas, comic books, clothing, brick walls and public construction hoarding. This variety of presentation has inspired many patrons to take it a step further. I have been asked to paint just about everything from furniture to cars and even the human body. Each new challenge breaths new life into the work. This page features some of the unusual commissioned requests I have documented over the years. 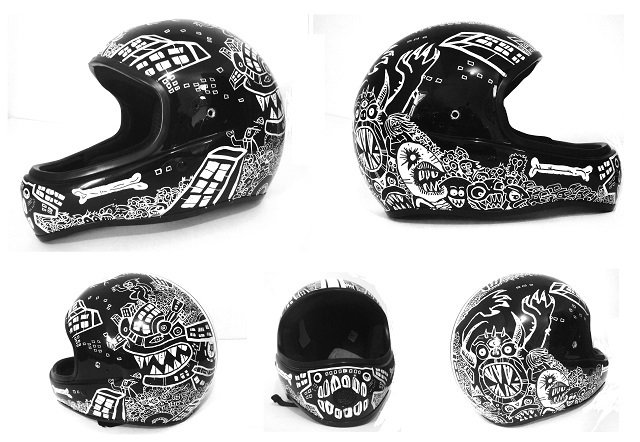 The top images show a hand painted steel guitar and custom full-face skateboard helmet. In both cases the clients basically just handed over the objects and let me go crazy. For the guitar I did a city scene with a centrifugal eye were the music comes from. You can read more about the musical instruments I have painted here. For the helmet I did a crowd of monsters wrapped around the base with a larger creature face in the front. To the left and below are pictures of a decorated chair and laptop. Again these paintings were left up to my imagination. 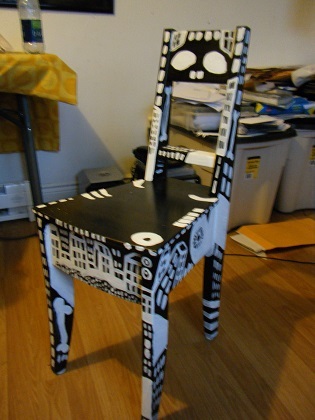 The chair was fun as I gave it some anthropomorphic characteristics. While the base and back are covered with surreal cartoons the legs feature leg bones and the top is grinning and staring at us with ominous eyes. The custom artwork for Laptop Cover was for a client who was visiting Toronto who wanted to make it a memorable and original souvenir. 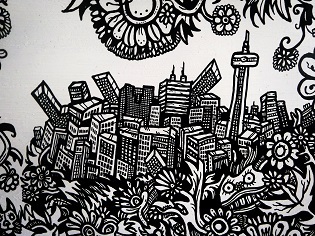 The drawing depicts the city of Toronto as viewed from a mystical forest. The surrealist foreground is filled with imaginative birds, flowers, animals and creatures organically connected in a playfully art-deco style. In the distance the city is shown as if it were made of gears busily encompassed by spiraling metropolitan routines. The image is also meant to help us escape the grind of the computer ( hence the nature images) while reminding us of the fun benefits of our daily computerized work.